The year 1996 marks the four hundred and fiftieth anniversary of the death of Martin Luther, whose famous Ninety-Five Theses sparked off a religious fire in Europe which the Roman Catholic Church was unable to extinguish. The theological conflict which ensued has often been characterized as focusing on the so-called four- fold "alones" of the Reformation: sola gratia, solo Christo, sola fide, sola Scriptura -- salvation is by grace alone, in Christ alone, by faith alone, and all that is necessary for salvation is taught in Scripture alone. Each of these principles, and certainly all four together, served as a canon by which the teaching of the Roman Catholic Church was assessed and found to be wanting. In these great slogans the nouns -- grace, Christ, faith, Scripture -- were and are of great importance. But in each case the qualifying sola (alone) was in some ways even more significant. For Rome had always taught that salvation was by grace through faith in Christ, and had always held that the Bible was the Word of God -- but never alone. To speak of sola Scriptura has almost always been viewed in Rome as a prescription for spiritual anarchy in which everyone would create for himself the message of the Bible. The only safeguard against this was the living tradition of the Church viewed as a further channel of the divine revelation. The printing press (and therefore widespread access to the Bible) is a Renaissance phenomenon, and literacy levels were low in the Middle Ages. But this alone does not account for the Reformation horror stories about the large-scale ignorance of the Bible among both priest and people. Nevertheless it would be uncharitable to extrapolate from those dark days to the present day as though no counter-reformations had taken place in the interim. And it would reveal considerable ignorance on the part of Protestants if they did not recognize that in the past century a widespread interest in the Bible has developed within the Roman Catholic Church. Can it be, then, that we now face a new situation in Roman Catholicism? For the first time since the Reformation "common" Bibles are being published. Moreover, not only within the World Council of Churches (largely dominated by liberal theology), but also within evangelicalism substantial rapprochement has been viewed as possible in our own time. So it is timely to ask: Has something unprecedented happened within Roman Catholicism's interpretation of the Bible so that the old differences can, at last, be laid to rest? During the past century and a quarter -- from the First Vatican Council (1870) to the publication of the Pontifical Biblical Commission's important work The Interpretation of the Bible in the Church (1993) -- the Roman Magisterium has published a series of significant statements on the nature, interpretation and role of the Bible in the Church. These began in the nineteenth century in the widespread crisis for faith created by the effect of Enlightenment thought and thereafter by the onslaught of scientific humanism which found its impetus in the evolutionism of the late nineteenth century. Pronouncements have continued to appear up to the present day, when the Vatican has sought to wed together contemporary historical-critical methods of biblical interpretation with the ancient dogmas of the Church. Each of these statements is of interest on its own account; together they mark a development which has been significant for the work of large numbers of Roman Catholic biblical scholars. The story of this development is not well known among Protestants. Indeed probably most Roman Catholics are relatively unfamiliar with it. It is worth narrating, at least in broad outline. Developments in Rome In 1893 Pope Leo XIII issued the Encyclical Letter Providentissimus Deus. It was the first wide ranging attempt of the Roman Church to deal specifically with the impact of the critical methodologies which had come to characterize theological scholarship in the latter part of the nineteenth century. In them the Bible was treated as an ancient Near Eastern text and assessed from the standpoint of critical historical investigation and linguistic and religious development. In sophisticated theological terms, Scripture's "humanity" was explored (and, in fact, its divinity was increasingly ignored and denied). Against this background, in which the idea of human evolution played a major role, Providentissimus Deus insisted on a long-standing principle of Christian orthodoxy: If God is Author of both Nature and Scripture, these two "books" of divine revelation must be in harmony with each other. The encyclical emphasized that there could therefore be no ultimate conflict between the Bible and either the natural sciences or historical investigation. It urged both theologians and scientists to respect the limits of their own spheres. In addition, biblical exegetes who employed the fruits of secular scientific and historical studies were counseled to remember the importance of the analogia fidei (analogy of faith): the Scriptures should always be interpreted in keeping with the apostolic rule of faith to which the church subscribed. The last word on what the Bible taught lay with the Roman Magisterium. Providentissimus Deus was thus characterized by a conservative (some would have said "reactionary") character, expressed particularly in its negative criticisms of the way in which historical-critical principles were being used. The underlying anxiety of the entire encyclical was that the results of this critical movement would prove to be injurious to the faith of which the Church was called to be the guardian, not the destroyer. Fifty years later the face of Europe had changed dramatically. The Great War had been fought from 1914 -- 18; the Second World War of 1939 -- 45 was in full course. The misplaced and anthropocentric optimism of nineteenth-century liberal theology had collapsed, shattered before the enormity of human need; the notion that humanity was evolving from a lower to a higher moral condition had been dealt an embarrassing blow. The "gospel" of the universal Fatherhood of God and the brotherhood of man stood exposed in all of its inherent poverty. There arose a new sense of need for some powerful word from God. In Protestantism the "theology of crisis" emerged and what came to be known as the "Biblical Theology" movement was stirring into life. Significant developments had also taken place within the world of Roman Catholic biblical scholarship. The Pontifical Biblical Commission was created by Leo XIII in 1902. In the wake of Providentissimus Deus, its earliest responses (responsa) to questions of biblical interpretation were characterized by negative reaction to higher criticism. But in due season (it was completely reorganized in 1971 following the Second Vatican Council) it would prove to be a spearhead of the new way of reading the Bible. In 1943, Pius XII issued his Encyclical Letter Divino Afflante Spiritu. It was promulgated when the Second World War was in full flood, but not until the turn of the decade did its full impact begin to be felt. Now a more positive note was struck. For one thing, Roman Catholic biblical scholars were largely set free from the burden which the Church had carried for centuries: the use of the Vulgate (Jerome's Latin translation of the Bible). It had been regarded as the authoritative text for ecclesiastical use since the time of the Council of Trent (even now it was still declared to be "free from all error in matters of faith and morals"). In a manner reminiscent of the humanists of the Renaissance, with the motto ad fonies ("back to the original sources"), Roman Catholic scholars now enjoyed a new freedom and fresh impetus to gain and employ expertise in the biblical languages to enable a true understanding of the text of Scripture. A new value was recognized in the use of such tools as textual, literary and form criticism. The importance of history, ethnology, archaeology "and other sciences" was affirmed. The "true meaning," indeed the so-called "literal sense" of Scripture was to be sought as well as the "spiritual significance." Precritical ways of reading the Bible were widely (but not entirely) replaced by the new approach. Now a clear distinction was made between the "meaning" of the original text and the contemporary application ("significance") of it. Principles of interpretation which had long been familiar to Protestants were now increasingly recognized as essential to proper biblical exegesis. The historical-critical method had come to stay. All this was encouraged (it could scarcely have been prevented, but the genius of Rome, unlike Wittenberg and Geneva, has always been its ability to hold opposite tendencies together). The underlying principle was that the Scriptures cannot be charged with error. Supposed errors in Scripture, it was held, could be resolved by a right reading of the text. Any tensions between Scripture and "reality" could always be resolved in favor of biblical integrity. Harmonization was an essential key to reading the Bible as a modern Catholic. Times change, and we change with them. The second half of the twentieth century has seen continued movement in Roman Catholic biblical scholarship. This has not been without ecclesiastical bloodletting (at one point professors at the Biblical Institute were banned from teaching!). But the overall result has been that some of the most erudite biblical studies published during this period carry the imprimatur and nihil obstat which identify them as the work of Roman Catholic scholars which has been declared "free of doctrinal or moral error." The most recent succinct expression of this development can be seen in the Pontifical Biblical Commission's statement on biblical interpretation, published in 1993. Here the fruits of critical scholarship set within the context of the Church's tradition are warmly welcomed. Indeed, strikingly -- in view of the importance of the principle of harmonization at all costs which marked earlier Roman Catholic pronouncements -- it is now of a Protestant-style fundamentalist approach to Scripture that the Church seems to have become most critical, and perhaps most fearful. But why should this development since 1870 be of interest to Protestant Christians? For a reason which lies on the surface of much of the very best Catholic biblical scholarship. There is a clear recognition in Roman Catholic biblical scholarship that there is a gulf -- or at least a distance -- between what the text of Sacred Scripture states and the teaching of the Sacred Tradition of the Church. There is also recognition that the words of Jesus recorded in John 16:12 -- 15, often taken as a specific promise guaranteeing the truth and infallibility of Sacred Tradition, do not refer to such Tradition at all. (1) By necessity, therefore, some Roman Catholic interpreters of Scripture have found it necessary to develop a novel view of the relationship between Scripture and Tradition in order to hold them Together: Tradition adds to Scripture, but Scripture is "open" to Tradition. Can this contention be readily illustrated from Roman Catholic biblical scholarship? In critical discussion it is always a great temptation to treat the most extreme examples of the opposition's viewpoint as though they were representative. That is an unworthy tactic and often merely hardens prejudices on both sides. In this context, however, the point can readily be illustrated not from the worst historical examples of Roman Catholic biblical interpretation, but -- albeit from a necessarily limited sample -- by what is widely regarded as its best. It would be hard to find a better illustration of the new approach to the Bible in Roman Catholicism than the recent widely acclaimed commentary on Romans by Joseph A. Fitzmyer. Professor Fitzmyer is a leading Roman Catholic scholar whose outstanding academic gifts pervade his almost 800-page commentary. While it is often true in the matter of commentaries that "one man's meat is another man's poison," it is impossible to imagine any student of Scripture failing to find considerable profit from the erudition and stimulus of Fitzmyer's work. 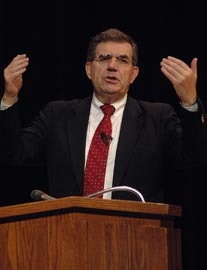 Raymond E. Brown, the outstanding American Catholic Johannine scholar, describes Fitzmyer as "the most learned N[ew] T[estament] scholar on the American Catholic scene. "(2) Elsewhere he says of his work on Romans that "It can lay fair claim to being the best commentary on Romans in English. "(3) Even those who might award the palm to someone other than Fitzmyer recognize the value of the commendation. But it is precisely because of the quality of this commentary that its contents are so significant. A desire for careful exegesis coupled with faithfulness to the Magisterium of the Church leads Fitzmyer (a Jesuit) to state, albeit with appropriate sensitivity and discretion, that the teaching of the Scriptures cannot simpliciter be identified with the teachings of the Sacred Tradition. The following selection of illustrations will underline this. A Roman Catholic on Romans In an extensive introductory chapter on Pauline theology, Fitzmyer includes an essay on faith. In the developed theology of the medieval period, theologians had spoken and written much of fides caritate formata, justifying faith which was "faith formed by love." This, not "faith alone," justifies. This view was confirmed at the Council of Trent. Here is an important recognition of the fact that we must distinguish between what the Tradition has said and what the Scriptures actually affirm. The idea of faith and love being instrumental in justification cannot be read out of the text as such. It is no part of the exegesis of Paul's words. Note however that Fitzmyer is careful to suggest only that there is distance between what is affirmed by Paul and what is stated in the Tradition. He does not affirm that there is any necessary contradiction between Scripture and Tradition. More is to follow. Commenting on the central passage, Romans 3:21 -- 26, Fitzmyer states that Paul here formulates "three, or possibly four, effects of the Christ-event [i.e., the work of Christ]...: justification, redemption, expiation, and possibly pardon" and adds, "It is important to recognize that such effects of the Christ-event are appropriated through faith in Christ Jesus, and only through faith. It is the means whereby human beings experience what Christ has done. "(6) Here again the Pauline text is to be read on its own terms without recourse to post-Pauline developments in the Church. Fitzmyer knows that within the Church there have always been those who have read Paul's words as implying the principle of sola fide. It would be quite wrong, however (indeed naive), to read this distancing of the Church's pronouncements from the statements of the biblical text as a capitulation to the Protestant exposition. For Fitzmyer is no less careful to point out the difference between the text and the way in which it has been interpreted within the Protestant churches. Within a page of the previous citation we find Professor Fitzmyer rejecting the interpretation of a Protestant scholar on the grounds that "that reading would introduce an Anselmian distinction into the Pauline text, which does not warrant it. "(7) But even here the concern is to allow Paul to speak for himself in distinction from reading him through the eyes of the construction of a postbiblical tradition (in this case one which also appealed to Protestantism). Whether or not Fitzmyer's critique is accurate, what is at first sight remarkable is the way in which his recognition of Paul's emphasis on the unique role of faith might easily be mistaken for the comment of a Protestant exegete. There are other noteworthy illustrations of an exegesis which self-consciously seeks to let the Scriptures speak for themselves apart from the. dominance of theological tradition. In this sense the Roman Catholic scholar is approaching the text in a manner similar to the Protestant. Here again, without rejecting Tridentine teaching as such, a distinction is made between what the text itself states and the theology which has developed within the Catholic tradition. The comments which may strike the Protestant mind as most unexpected are to be found in Professor Fitzmyer's exposition of Romans 3:27 -- 31. It was in his translation of Romans 3:28 in 1522 that Luther's appeal to sola fide emerged as seminal for the Reformation understanding of the gospel. Fitzmyer recognizes that in fact this language long predates Luther and can be found already in the writings of the early Fathers. He frankly states that "in this context" Paul means "by faith alone" although he contends that in the Lutheran sense its use is an extension of what Paul says. This inevitably prompts questions as to what the nature of this "extension" is, and whether there is any Roman Catholic "sense" in which justification is genuinely "by faith alone." But the admission in and of itself is significant. This tradition found its formal conciliar expression in the Tridentine Decretum de peccato originali, Sess. V, 2 -- 4... This decree gave a definitive interpretation to the Pauline text in the sense that his words teach a form of the dogma of Original Sin, a rare text that enjoys such an interpretation. Again we can hardly avoid noting the caution which emerges with respect to reading Church Tradition back into Scripture. The dogma as such is not rejected; what is made clear is that it is not to be identified simpliciter with the teaching contained in the New Testament. Again we must not make the mistake of thinking that Fitzmyer has ceased to be a faithful son of the Church. For this, he notes (in agreement with the earlier biblical scholar M-J. Lagrange), "might be an exact theological transposition," but it is a precision not yet found in the Pauline text. Our concern here is not to discuss the precision of the theology involved in this statement, but once more to underline the gap -- although for Fitzmyer manifestly not an unbridgeable historical gulf -- which is fixed between the revelation as it comes to us in Scripture and what the Church has received as its authoritative Tradition. No doubt this whole approach strikes anxiety in the hearts of Roman Catholics who are conservative and traditionalist (there are "fundamentalists" in both Roman Catholicism and Protestantism). They may find some relief in the way Professor Fitzmyer's concurrence with the Roman Tradition is given notable expression in his handling of Paul's teaching on justification. Professor Fitzmyer nuances the meaning of dikaioo in the direction of "being made upright." Here, at perhaps the most critical point, his exegesis harmonizes with the Vulgate's translation of the New Testament's dikaioo by justum facere. Much is at stake here. In many areas where Sacred Tradition is not already present and perspicuous in Sacred Scripture, Fitzmyer and other Roman Catholic scholars reduce the gap between what is taught in the biblical text and the dogma of Sacred Tradition by an appeal to the "open" character of biblical teaching. In this way they minimize the force of the Reformation criticism that Tradition contradicts Scripture. No appeal to the theory of Scripture's "open" character can be of service, however, in relationship to the doctrine of justification. It would simply not be possible for Fitzmyer at this juncture to agree with the Reformation exegesis of justification as declaratory, imputed righteousness yet appeal to the "open" character of Paul's teaching and to the Spirit's continuing work in the Church as bringing out the fullness of meaning in justification as including infused righteousness. For these two things stand in contradiction. Fitzmyer's interpretation is, nevertheless, based on an exegetical appeal -- to his own exegesis of Romans 5:19: "Just as through the disobedience of one man many were made sinners, so through the obedience of one many will be made upright. "(14) He takes Paul's verb kathistanai ("made") in the sense of subjective condition, i.e., in a transformationist sense. Two things should be said here. First, we believe Fitzmyer's interpretation of Romans 5:19 can be demonstrated to be mistaken. (15) But second, his logic is wrong. Even were kathistanai understood in a subjective-transformationist sense, it does not necessarily follow that Paul's use of dikaioo is transformationist rather than forensic and declaratory. Consistently to interpret "justify" in the light of this assumption is an exegetical procedure without justification! But even here there is a formal recognition of the principle: Sacred Scripture must be distinguished from Sacred Tradition; we should not assume that the latter is an exegesis of the former. Naturally Protestants view this distinction through Protestantized spectacles. Anyone convinced of the sole authority and sufficiency of Scripture is bound to ask how it is possible for a scholar of integrity to recognize this gap and yet to remain a faithful Roman Catholic. It is too simple a construction, however, to conclude that there is manifest duplicity here. Rather, the general consistency and clarity with which Fitzmyer's exegesis illustrates the gap between Scripture and Tradition highlights why it is that the Protestant appeal to Scripture alone to refute Roman Catholic dogma seems to cut little ice: For Rome, neither Scripture nor Tradition can stand on its own. The rationale for this should now be clear: In the Roman Catholic Church, Sacred Tradition stands beside Sacred Scripture as a valid and authoritative source of divine revelation. In fact both emerge within one and the same context: the Catholic Church. Understanding this principle helps us to see the mindset of the Roman Catholic Church's approach to interpreting the Bible at this juncture. Scripture and Tradition For Rome, the Bible itself emerges from within the Church. The Church exists prior to the Bible; the Bible is itself an expression of the living voice of the Church -- in its own way it is Tradition. In the words of the recent Catechism of the Catholic Church, "the New Testament itself demonstrates the process of living Tradition. "(16) The New Testament is Tradition -- the earliest tradition inscripturated in distinction from the living Tradition which arises within the ongoing life of the Church in the context of apostolic succession. This perspective is well attested in the succession of Rome's authoritative doctrinal statements. The implication of this, specifically drawn out by the Council itself, was that no one should dare to interpret the Scripture in a way contrary to the unanimous consent of the Fathers, even though such interpretations are not intended for publication. Leaving to one side the doubtful concept of "the unanimous consent of the Fathers," it is clear here why the Tradition becomes the master element in the Scripture-Tradition liaison. Historically it has always been the case that a "living" (in the sense of contemporaneous) word of revelation will become the rule for Christians de facto (whatever may be claimed to the contrary). That is virtually a psychological inevitability. In the case of Rome, what may have begun as a limiting concept (the regulum fidei) developed into the master concept. This position, with appeal to these very citations, was later confirmed by the Church at the First Vatican Council in the Dogmatic Constitution Dei Filius (1870). A quarter of a century later, Providentissimus Deus (1893) appealed to the principle of the analogy of faith understood as the consensus fidelium as an essential principle for Catholic exposition. Roman Catholic exegetes were summoned to use critical skills with the specific agenda of confirming the received interpretation. The circle of reasoning here appears to be " Vicious." In the nineteenth century the Magisterium rightly recognised that the rise of Higher Criticism and of theological Modernism would endanger the faith of Catholics (as it had already done among Protestants). But Rome faced an additional problem. The view that Sacred Tradition is also Revelation implies that the Tradition possesses the attributes of Revelation, including infallibility and inerrancy. Consequently the Tradition had to be regarded as infallible. The inevitable correlate of this emerged in Vatican I's Dogmatic Constitution Pastor Aeternus in which papal infallibility was promulgated as a "divinely revealed dogma". The Pope's ex cathedra definitions of faith were stated to be "irreformable of themselves and not from the consent of the Church" ("I myself am the Tradition," commented Pius IX). The anathema sit was pronounced on any who might "contradict this our definition." We ought not to make the mistake of assuming that the Roman Catholic Church is thoroughly monolithic. As we have noted, it too has a conservative and liberal wing. Problems and disagreements arise in tracing and exegeting the Tradition as much as in exegeting the Scriptures! Thus, for example, it has become characteristic of many Roman Catholic scholars to reread the Tradition in as ecumenical a fashion as possible. No hint of criticism is made of the fact that Sacred Tradition requires belief in dogma which is not contained in Sacred Scripture. But there is present here a hint that exegetes in the past (and still today) may read the New Testament as though it had been written in the light of the Tradition, and thus distort the teaching of Sacred Scripture (and by implication perhaps also the function of the Tradition). Implicit in this is the recognition of the substance-gap between Sacred Scripture and Sacred Tradition. The historic Protestant view is that this gap becomes a chasm at certain strategic points. There is an unbearable discrepancy, not merely a healthy tension, between Sacred Scripture and Sacred Tradition in many areas. A wide variety of factors contributed to the Reformation of the sixteenth century. Among the chief was the discovery, fueled by the Renaissance spirit of ad fontes, that the gap between the clear teaching of Scripture and the teaching of the Tradition was at points so great as to involve not merely development but contradiction. Roman Catholic scholars such as Professor Fitzmyer have been given the freedom to explore what Scripture teaches. They discover themselves looking over their shoulders at the Roman Catholic traditionalists who do not hide their anxiety that such open distancing between Scripture and Tradition will be the downfall of the Church. Consequently their characteristic refrain is that the difference between the content of Scripture and the content of the Tradition does not involve contradiction but only development. What becomes clearer than ever, however, is that the pririciple of sola Scriptura remains a watershed. As Cardinal Ratzinger as much as admitted in his reaction to Geiselmann, there are major Roman doctrines which are simply not found in the Scriptures. In this sense Scripture alone cannot be regarded as sufficient for the life of the Church. But we must go further. There are important teachings in the Tradition which are not only additional to, but different from and contradictory to, the teaching of Sacred Scripture. These include the very doctrines which were the centerpiece of the Reformation struggle: the nature of justification; the importance of the principle of sola fide; the number of the sacraments; the sufficiency of the work of Christ, the effect of baptism, the presence of Christ at the Supper, the priesthood of all believers, the celibacy of the priesthood, the character and role of Mary, and much else. The more that Scripture is exegeted on its own terms the more it will become clear that in these areas Sacred Tradition does not merely add to Sacred Scripture, it contradicts it. And if it does, can it any longer be "sacred"? A major development has taken place, then, in Roman Catholic interpretation of Scripture. For this we may be grateful. We should not grudgingly minimize the rediscovery of the Bible. Indeed it might help us greatly if we recalled more often than we do that responsibility for the confusion in Rome's understanding of justification rests partly on the shoulders of the great Augustine himself whom we often claim with Calvin as "wholly ours." Having said this, however, it is now clearer than ever (pace Geiselmann) that the Roman Catholic Church cannot and will not subscribe to sola Scriptura. It must deny the sole sufficiency of the Bible. And, as the Reformers recognized, so long as Rome appeals to two sources, or even tributaries, of revelation, the contents of Scripture and the substance of its own Tradition, it is inevitable that it will also withstand the message of Scripture and of the Reformation: sola gratia, solo Christo, sola fide. 1 See, for example, Raymond E. Brown, The Gospel According to John, Vol. 2 (Garden City, N.Y.: Anchor Press, 1966) pp. 714-717. 2 Raymond E. Brown, Biblical Exegesis and Church Doctrine (New York: Paulist Press, 1985) p.9. 3 Cited on the dustjacket of Joseph A. Fitzmyer, Romans (New York, 1994). 4 Council of Trent's Decree on Justification, Canon XI.. See Rev. H. J. Schroeder, O. P. Canons and Decrees of the Council of Trent (Rockford, Ill.: Tan, 1978). 5 Fitzmyer, Romans, p. 138. 10 Council of Trent's Decree Concerning Original Sin, Session V in Schroeder. 11 Council of Trent's Decree on Justification, Session VII in Schroeder. 14 The translation is Fitzmyer's. 15 See, e.g. Douglas Moo, Romans, Vol. 1 (Chicago. : Moody, 1991) pp. 358-9; J. Murray, The Epistle to the Romans, Vol. 1 (Grand Rapids: Eerdmans, 1959) pp. 205 -- 6, 336 -- 362. 16 Catechism of the Catholic Church (Liquori, Mo. : Liquori, 1994) p. 26, #83. 17 Decrees on Sacred Books and on Traditions to be Received, 1S46. 18 J. Neuner and J. Dupois, eds., The Christian Faith in the Doctrinal Documents of the Catholic Church, rev. ed. (Staten Island,: Alba, 1982) p. 79. 19 The interpretation of the Bible in the Church (Boston, 1993) p. 121. 20 Dogmatic Consitution on Divine Revelation, II:8. (For an English translation of the pronouncements of Vatican II, see Walter M. Abbott, ed., The Documents of Vatican lI, New York: Crossroad, 1966). 22 The view Geiselmann rejects has been the view of the major Roman apologists since Trent. For a brief account see J. R. Geiselmann, "Scripture, Tradition, and the Church: An Ecumenical Problem" in D. J. Callahan, H. A. Obermann, and D. J. O'Hanlon, eds., Christianity Divided (London, 1962) pp. 39 -- 72. 23 J. Ratzinger in K. Rahner and J. Ratzinger, Revelation and Tradition, translated from the German, Offenbarung und Uberlieferung, by W. J. O'Hara (New York, 1966) p. 33. The references to 1854 and 1950 are to the Bull lneffabilis Deus promulgating the doctrine of the Immaculate Conception (i.e., the perpetual sinlessness of the virgin Mary) and to the Apostolic Constitution Munificentissimus Deus which promulgated the Bodily Assumption into heaven of the virgin Mary. 24 Catechism of the Catholic Church, p. 27, #85. 25 The interpretation of the Bible in the Church, p. 89. 27 "Decree Concerning the Edition, and the Use, of the Sacred Books," in Phillip Schaff, The Creeds of Christendom, Vol.2 (Grand Rapids: Baker, 1966) p. 83.